Galina Istomin is from St. Petersburg, Russia where she studied at the St. Petersburg Conservatory. Before coming to the United States in 1991, she played in many ensembles including the Moussorgsky State Opera and Ballet Theater in St. Petersburg. 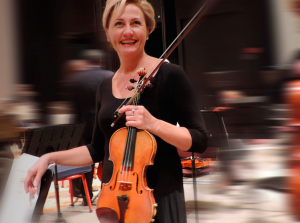 In this country she has played in the Richmond symphony and the Westmoreland Symphony, among others, and has served as concertmaster for the Butler Symphony. In Pittsburgh Galina has played in the Benedum Orchestra for opera and ballet. Galina is also performing solo and chamber music concerts in the Pittsburgh area. In addition to the Edgewood Symphony, she serves as concertmaster of the Butler Symphony and Pittsburgh Philarmonic Orchestra. Visit www.galinaistomin.com for more information.